TIGER vs. PHIL: The concept of an “offseason” in golf has been dead for a few years now, as the major worldwide tours essentially play year-round, and a few special events like next month’s Hero World Challenge are there to fill in the blanks. Still, this week’s made-for-T.V. “Showdown at Shadow Creek”, an 18-hole match between Tiger Woods and Phil Mickelson held at Shadow Creek Golf Course in Las Vegas, is a unique concept in many ways, and opinions are very much mixed as to whether it’s a welcome shake-up from the same old full-field 72-hole stroke play events that dominate professional golf, or whether the idea of two multi-millionaires facing off for an obscene amount of money with no spectators, and a pay-per-view only viewing audience (it’ll cost you $19.99 to witness this spectacle live) is distasteful to the point of sullying both men’s reputations and the game of golf itself. Now, setting aside the fact that this is absolutely the sort of thing that Gary Player would’ve been involved in back in his playing days, there is some validity to the notion of… well… why? Why is this happening? Do these guys not have enough money? I mean, Woods has made an estimated $1.7 billion over the course of his career according to Forbes, while Mickelson has brought in $815 million, making him the sixth highest-paid athlete of all time. And will this have any effect at all on either man’s reputation, regardless of the outcome? If Woods won every single hole, or vice-versa, would anybody really care? They’re legends of the game, for sure, but neither man has won a major since 2013, and both are on the wrong side of 40. I heard someone humorously suggest that the pay-per-view cost was $19.99 because that’s the last year it would’ve been worth that much money to watch these two play against each other on television. 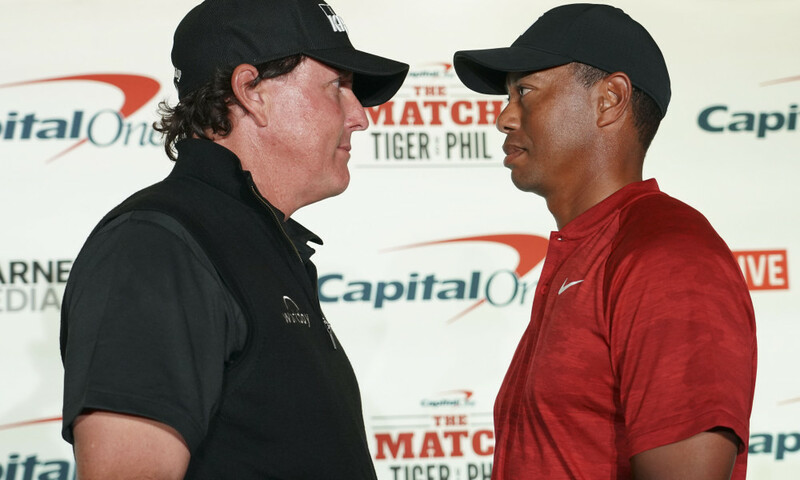 While that may be a little harsh, some of the cringe-worthy promotional stunts– like the forced boxing-style staredown, or the awkward “trash talk” soundbites, or the obviously staged $200,000 side-bet on Mickelson birdieing the first hole– make this event feel more like a cheesy sideshow than it probably should. Or maybe that was the intent all along… but if it was, again, why? Why is this happening? Of course, none of that is going to stop me from tuning in and having a bet. If nothing else, it gives thousands of married man an excuse to run out to the local sports bar on a Friday evening, and frame it as if it were the responsible thing to do– “why waste the money on buying it at home when they’re showing it at the bar?” Why indeed. Instead of poking holes in this thing and talking about all the reasons why it doesn’t mean anything and probably shouldn’t be happening, I much prefer to just enjoy it for what it is– two all-time greats facing off one more time. Thirty years from now, we’d probably pay ten times what they’re charging to watch 40-something Woods and Mickelson in action again. They seem to be having fun with it, so we should too. In terms of who is going to come out on top, I haven’t the slightest clue. Tiger’s status as the favorite is understandable: he played better than Mickelson this past season, and of course he dominated the rivalry– if you could even call something so one-sided a rivalry– for the better part of 20 years. This sort of format could favor Mickelson, however, as his dominance of the PGA Tour’s Tuesday Money Game circuit has become legendary, and Tiger has shown vulnerability in match play settings. Plus, by his own admission Woods “shut it down” for a few weeks following the Ryder Cup, playing little-to-no golf, so the current state of his game is anybody’s guess.